Whether a raccoon has invaded your home or is caught in a trap outside, you must take the proper precautions when you release it into the wild. You must prevent the animal from returning without moving it to an alien environment, which drastically reduces its chance of survival. You also must take care when handling the raccoon, as it may carry a dangerous disease or display aggressive behavior. Check the legality of catching and releasing raccoons in your state before attempting to handle the animal. Some states prohibit citizens from releasing raccoons into the wild. Other legal jurisdictions prohibit releasing animals on public land. Research the rules online or contact a local animal control agency. Find a suitable release location within 10 to 20 miles of your home. You must move the raccoon far enough away to prevent it from returning. However, if you move it too far, it may be unable to adapt to the drastic change in environment. The release location should be similar to the animal's current environment. Select a spot with fresh water and shelter if possible. Don thick, heavy gloves before handling the animal or its cage. 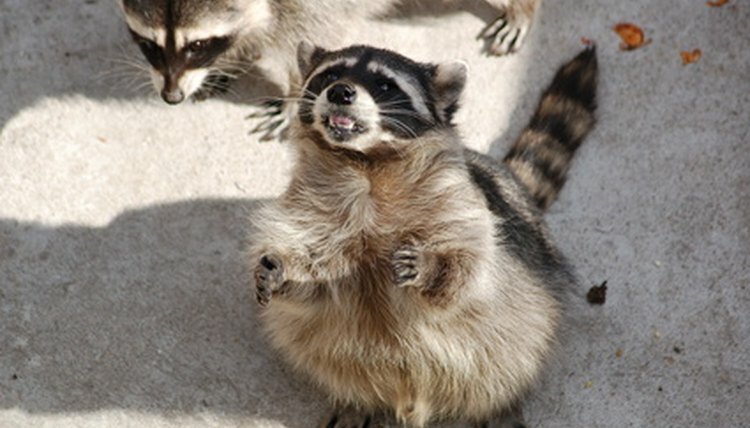 If the raccoon is in a portable trap, simply leave the animal inside. Secure the door with twine or rope if it's loose. Keep your fingers as far from the raccoon as possible when you move the trap. Trapping is the safest way to capture and release a raccoon. Traps are available in stores and online. Humane traps do not harm the animal; some are even designed to facilitate the catch-and-release process. Inspect the raccoon before driving it to the release site. Contact an animal control agency if the animal appears sick or is overly aggressive. Secure the cage or trap to your vehicle with a seat belt or elastic cord to prevent jostling or bouncing during the drive. Transport the raccoon in the back of a pickup or SUV if possible. If you must place the carrier in your vehicle's interior, face the door of the trap or cage toward the door to prevent it from swinging open. Put the protective gloves on and move the cage to an open area near shelter. The raccoon may be reluctant to leave its container if it cannot see a place to hide. Set the carrier down and open the door. Move away from the animal and allow it to leave the carrier on its own.